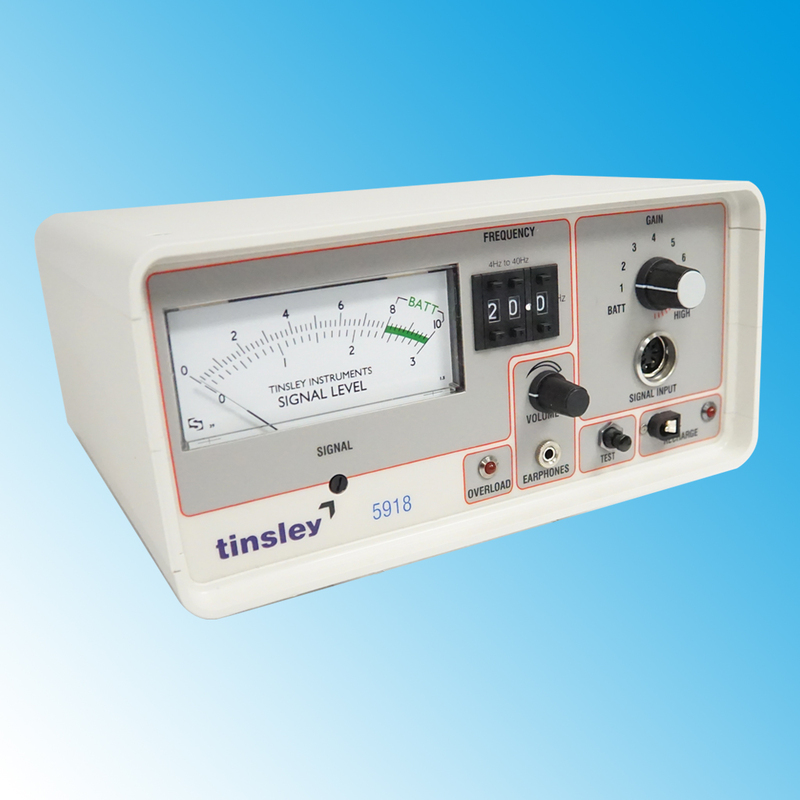 The 5917/5918 Electroding Probe and Detector system is a high gain low frequency selective Receiver/Amplifier to detect the electromagnetic field from a submarine cable energised by the Tinsley 5915 Electroding generator or similar. The 5917 Beach Probe and 5917D Divers Probe are inductive probes suitable for receiving 15 to 30Hz signals emanating from a suitably energised submarine cable. The 5918 detector amplifies, filters, and indicates the signal received at the selected frequency. At the highest gain setting a 10µV RMS input signal at the correct frequency will give a full scale reading on the analogue front panel meter. The 5918 electroding detector is completely self-contained in a portable carry case with shoulder strap. Integral rechargeable batteries are included and a separate mains power module is supplied to recharge them. In use the 5918 detector is connected to the receiving probe, either a Tinsley type 5917 Beach probe or 5917D Divers Probe. The exact operating frequency is selected on the thumbwheel switches and the gain switch is adjusted to obtain a useful indication of the signal. 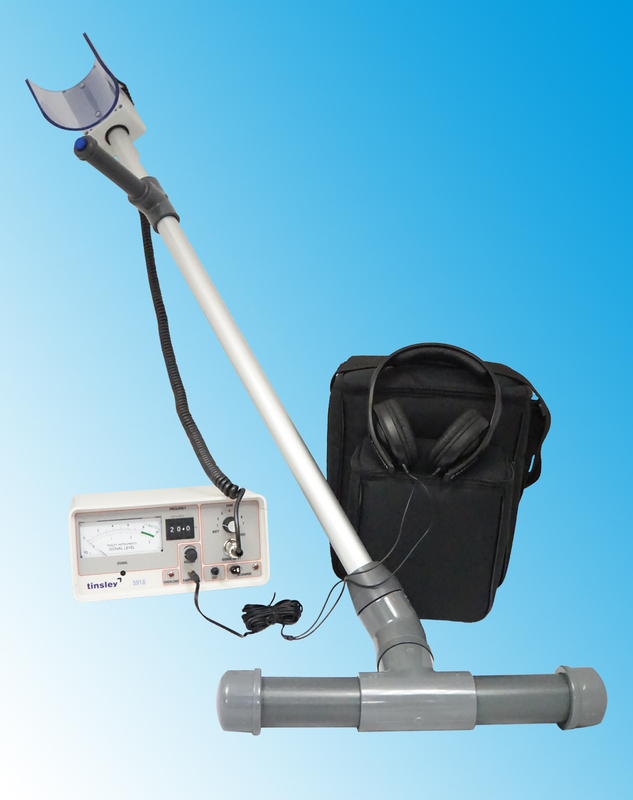 A frequency of either 16.7Hz or 25Hz is recommended when using the 5917 Probes. An audible output signal is available which can be heard by using the plug in headphones supplied. The larger the signal received the higher the frequency heard. A volume control is provided for adjustment of loudness. Tinsley" width="100%" height="239" allowFullScreen> 5917-18 Cable Tracking System Preview. from Tinsley" width="100%" height="239" allowFullScreen> Instrumentation on Vimeo. The 5917/5918 Probe and Detector System is used either on land, or on the beach. The 5917D Divers Probe can also be used in up to 50 metre water to locate submarine cables. A tone in the range of 16 Hz to 25 Hz is transmitted down the submarine cable by an Electroding Generator such as the Tinsley type 5915 unit. This signal is picked up by a Tinsley 5917 or 5917D Probe connected to the 5918 Detector. The 5818 Detector and 5917 Beach receiving probe would normally be held by a person walking along the beach, however, as they are portable, the detector may be operated from any small boat or launch to search over shallow water. The 5917D would normally be held by a diver and would be connected to the 5918 in a boat/ship via an umbilical cable. It is suitable for use in depth up to 50 Metres. The received signal is processed and passed to the analogue front panel meter and headphones audio output. Normally, the Electroding Generator, Tinsley type 5915, is located in the submarine cable Terminal Station nearest to the search area. When the Electroding Detector System is in the vicinity of the cable, the 5915 Electroding Generator is powered thus applying the low frequency signal to the cable under test. At these frequencies, the field of the signal extends into the land and water surrounding the cable for a considerable distance. The person holding the 5917 probe would normally walk/swim a course to cross the cable on the landward side of any expected cable fault position with the probe in its horizontal position at right angles to the cable. The Detector is set (by thumbwheel switch) to the frequency being transmitted by the Electroding Generator. A frequency of either 16.7Hz or 25 Hz is recommended. As the detector crosses the cable, the field from the signal current in the cable induces a voltage into the probe. This signal is then processed by the Electroding Detector and a deflection on the meter is registered. This may be heard by the operator as a high pitch frequency from the headphones. For identification purposes, the Electroding Generator may be keyed on and off periodically. Once the cable signal has been identified and confirmed, the person then follows the cable on a zigzag course to plot the position of the cable, or until the signal disappears. When this happens, a fault or break has been located. Further tests may be made for a more precise fix of the cable position by using the probe in a vertical orientation. In this case a null is registered when the probe passes exactly above the cable.